More than 1 million vote early in Mass. 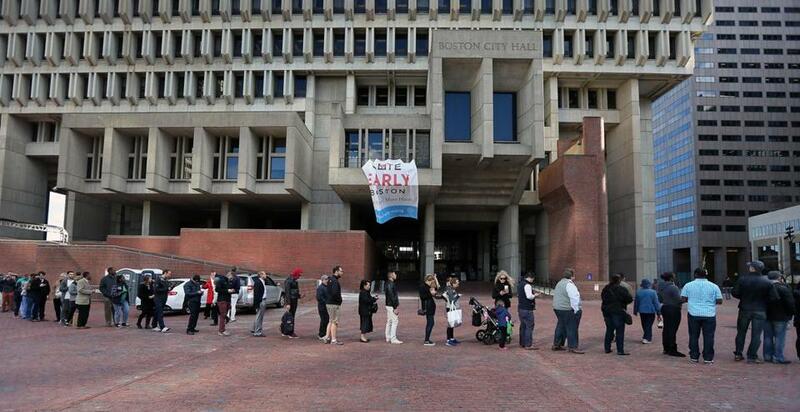 Long lines stretched across City Hall Plaza on the last day of early voting in Massachusetts. 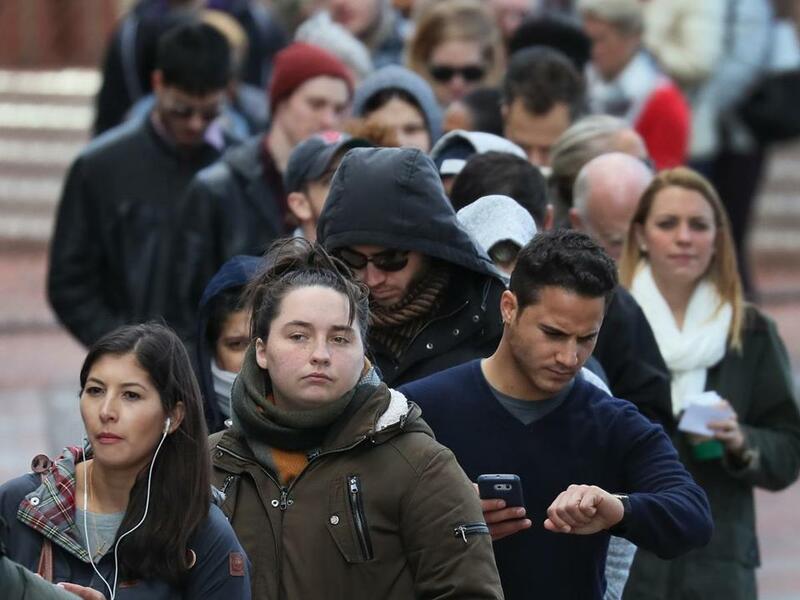 As Massachusetts’ first-ever period of early voting wrapped up Friday, officials said more than 1 million people cast ballots before Election Day. The number of early voters makes up 21 percent of the electorate, said Secretary of State William F. Galvin said. Absentee votes will be counted until noon Monday, Galvin said. Brian McNiff, a spokesman for Galvin’s office, had no estimate of how many people are expected to cast ballots by the end of Election Day. In 2008, 3.1 million votes were cast, and in 2012, nearly 3.2 million were cast. If a similar number of people end up voting this year, about a third of all votes cast have already been submitted. The early voting period ended Friday. In Boston, 44,301 people had voted as of 4 p.m. Friday. Those lines had formed outside City Hall since the early voting period began Oct. 24, but Irish said most people weren’t bothered by the wait. “We got a few complaints, but we got more positive feedback than negative,” Irish said. 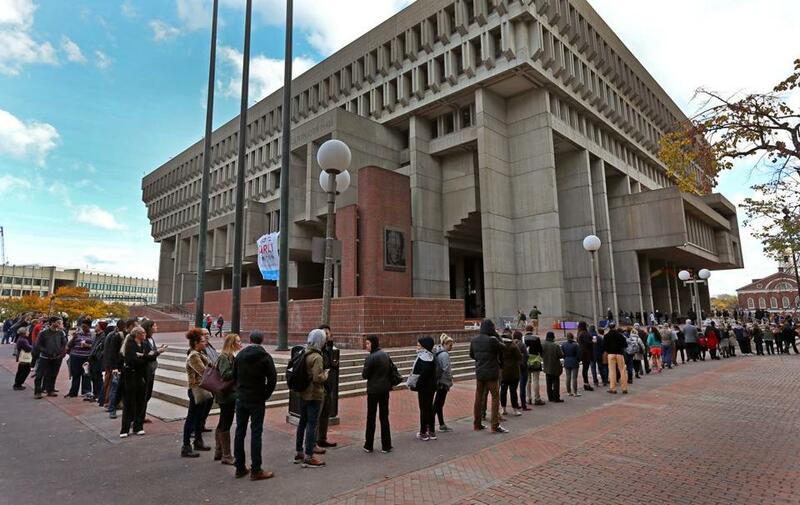 City Hall was open throughout the day during the voting period, and Boston had 27 additional sites that rotated hours to give voters the chance to vote in their neighborhoods. About 15,400 people had voted early in Worcester as of Friday afternoon, and about 8,000 had voted in Quincy, according to the clerk’s offices in the two cities. Tanya Ford, director of the Cambridge Election Commission, said the two-week voting period has gone very smoothly. 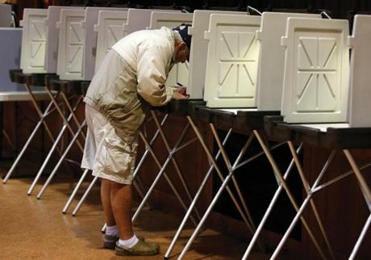 There, 17,258 voters had cast their ballots as of Friday morning. In Somerville, Election Commission Chairman Nicholas Salerno reported a similar experience. “The voters are happy to get it over with,” Salerno said. Newton City Clerk David Olson said he was pleased that 17,775 residents turned out to vote early, which accounts for about 30 percent of the town’s registered voters. “It’s better than we were expecting,” Olson said. More than 15,000 voters went to Salem City Hall over the past two weeks to cast their votes, according to Salerno. City Hall was the city’s only polling place, but Salerno said the lines were manageable. He said the longest wait he knew of was about a half-hour. “We haven’t got any complaints about the lines,” Salerno said. 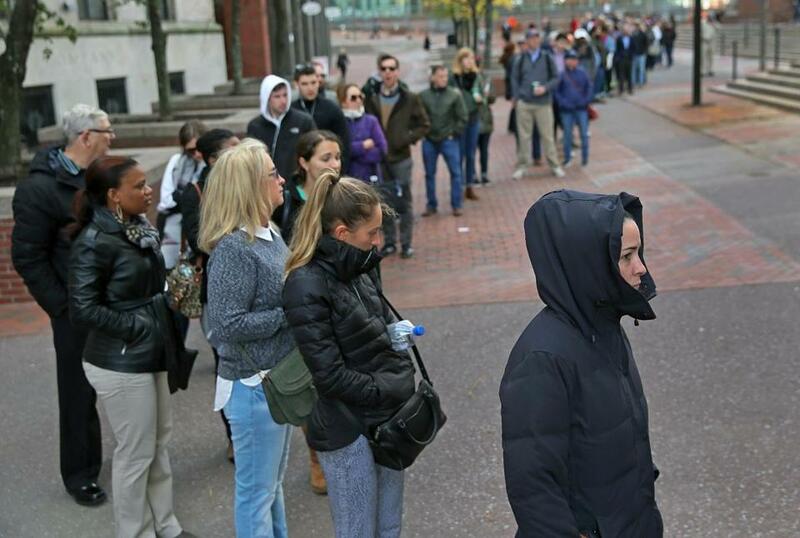 Boston was among several cities that asked for help from Galvin’s office after the long lines formed Friday. Galvin said people will be working all weekend to have all the work completed by Election Day. Globe correspondents Olivia Quintana, Olivia Arnold, and Samantha Gross contributed to this report. Dylan McGuinness can be reached at dylan.mcguinness@globe-.com. Follow him on Twitter at @DylMcGuinness.